Forty years after the NASA Apollo 16 mission, a dusty video has given scientists fresh perspective on the surface of the Moon. 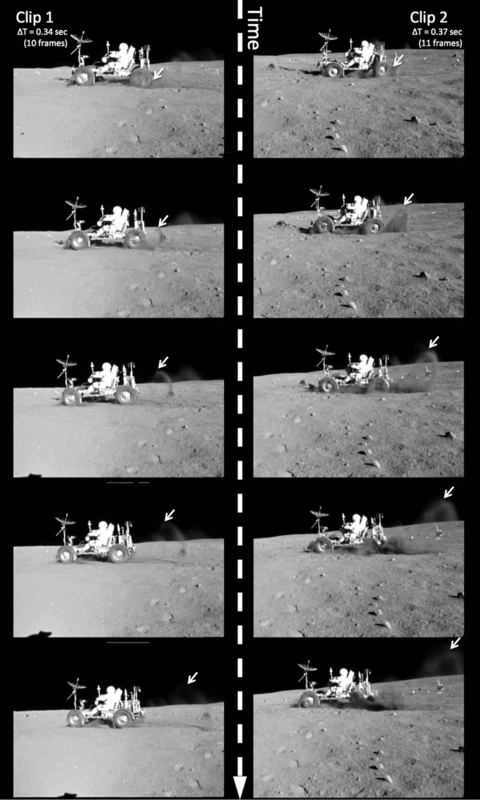 Scientists with the LASP Colorado Center for Lunar Dust and Atmospheric Studies (CCLDAS) analyzed Apollo 16 video images of dust clouds kicked up by the rover to show that they followed ballistic trajectories, or paths taken under the force of gravity alone. The analysis offers a unique teaching opportunity for advanced high school or early college physics classes about calculating the trajectories of projectiles. The analysis also shows that this footage could not possibly be taken on Earth. The dust trails, or “rooster tails,” were identified in two series of images taken from the 1972 video footage of the Apollo 16 Lunar Roving Vehicle, providing scientists, teachers, and students with unique visual information about the Moon’s relatively low gravity and lack of atmosphere. CCLDAS studies Moon dust through a combination of modeling, theory, and laboratory experiments. For more information about CCLDAS, please visit http://lasp.colorado.edu/ccldas.